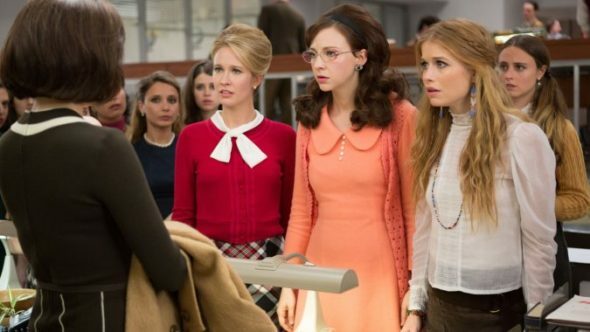 Good Girls Revolt is closer to coming back. Deadline reports the team behind the cancelled Amazon series is pitching a second season to potential networks. We have heard a great season two pitch and are taking it out this week and next week to several interested buyers, all of whom were incoming calls. Again, this is sort of back by popular demand. The showrunners have been in touch with the actresses, as well as our whole cast, and everybody’s very eager for a reunion. What do you think? Did you see season one of Good Girls Revolt? Would you watch a second season? Sadly it looks like this show isn’t coming back. I never will figure out why TV companies drop popular series and promote trashier stuff, it never seems to make sense. Page Reid (below) said it all much better than I.
I just began watching Good Girls Revolt yesterday and I can’t stop watching. Please, please bring it back!! It is the best TV I have seen since Sports Night! An important series (I hope), with excellent writing and acting. I protested when it was cancelled and am delighted to hear of its possible return. Fingers crossed. This is so great to hear. This series deserves to be on television. Please bring this back! Please bring the show back! Women are becoming empowered in the now but it’s important and even critical to understand the historical context of that empowerment. Women stood up when it was inconvenient and even dangerous to do so. We are part of that amazing continuum. The show reveals and celebrated that rich history and I want more! Thank you.